The Biology of the Monotremes is an attempt to make available all gathered information about monotremes to the greater public. This book specifically targets the students, newly graduates, teachers, and researchers interested in the study of life processes and evolution. This book comprises of 10 chapters. Each chapter except Chapter 10 discusses three genera - Ornithorhynchus, Tachyglossus, and Zaglossus. Chapter 1 serves as an introduction to the subject matter. It covers the discovery and general anatomy of the monotremes. 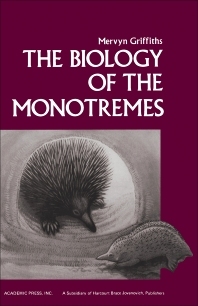 In accordance, Chapter 2 discusses the different kinds of monotremes and its other aspects. Aside from the mentioned genera, it also includes Obdurodon insignis. In Chapter 3, the food and feeding habits of the monotremes is given focus. Meanwhile, the varied physiology of monotremes is the subject of Chapter 4, and temperature regulation in Chapter 5. A more detailed and thorough discussion regarding the anatomy of the monotremes is provided in Chapters 6 through 9. The discussion covers topics including the glands in the endocrine and immune systems, as well as special senses, organs, and behavior of monotremes. Its reproduction and embryology is also discussed. This book explains as well the mammal’s lactation, composition of the milk, sucking, and growth of the young. Lastly, Chapter 10 provides the readers with four differing views regarding the relationship of the monotremes with the rest of the mammals.